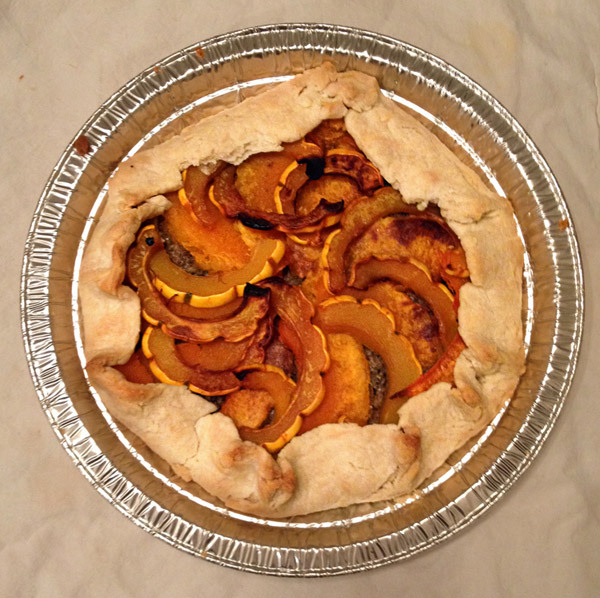 My dear friend Kim sent me a recipe from Oh My Veggies called Savoury Pumpkin Galette and both of us made them for our respective family Christmas dinners this year. Mine were a big hit at Christmas and I just finished making a fresh batch. I made four and froze two, so we got dinner and leftovers for lunches. 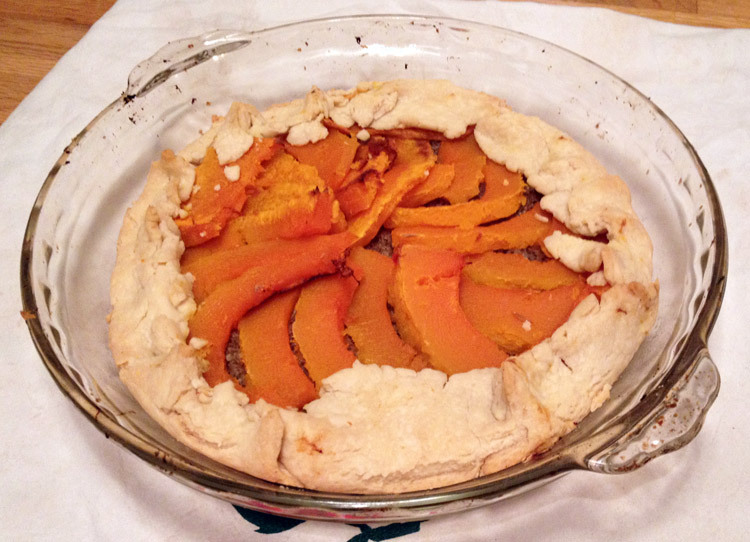 The first time I used blue hubbard and butternut squash, and this time I used delicata and butternut squash. I added garlic to the original recipe and found there was leftover filling so I adjusted the recipe last night and got 4 pies out of the following ingredients. 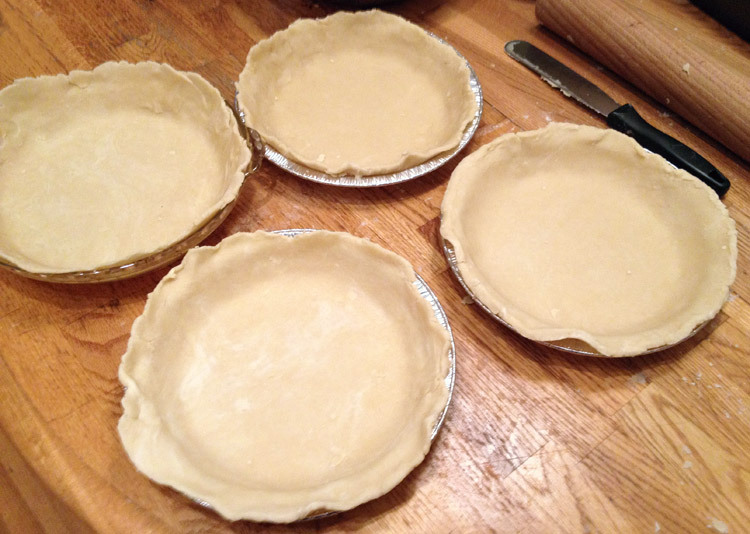 4 pie crusts (see note below on making your own. Kim used puffed pastry and said that worked too. I am sure the filling would also be wonderful in filo pastry triangles). 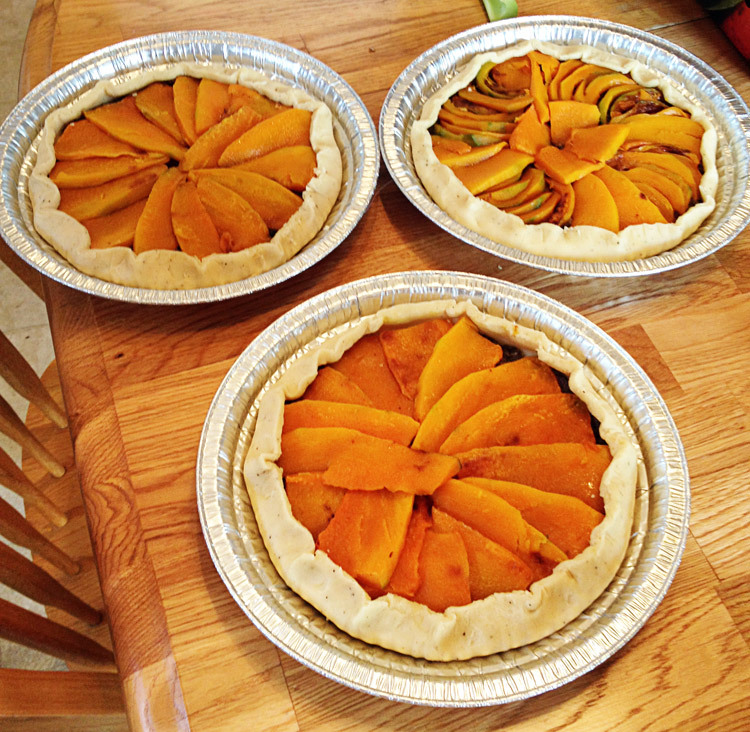 *Edit: I recently made this crust recipe from our local produce supplier and doubled it for the 4 pie shells. I used butter and 3 parts white flour to 1 part whole wheat flour. The dough was very easy to work with and turned out great. 1. Cut into wedges that are 1/4 inch thick. Keep in mind you will want to layer them around the pie in a circle so if you can keep the wedge sizes similar that helps. 3. Oil baking sheets lightly to prevent sticking. 4. 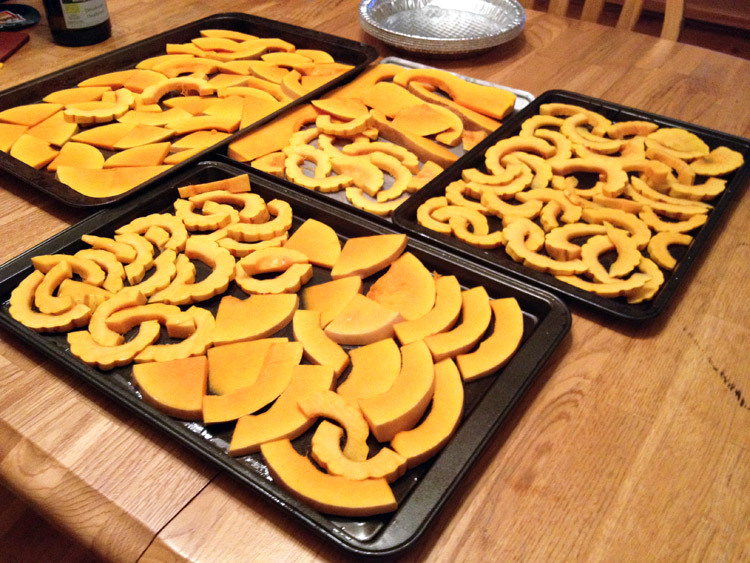 Place squash wedges on baking sheets in a single layer. 5. Bake 20-30 minutes until soft. If some pieces are slightly starting to brown that would be a good time to pull them out. 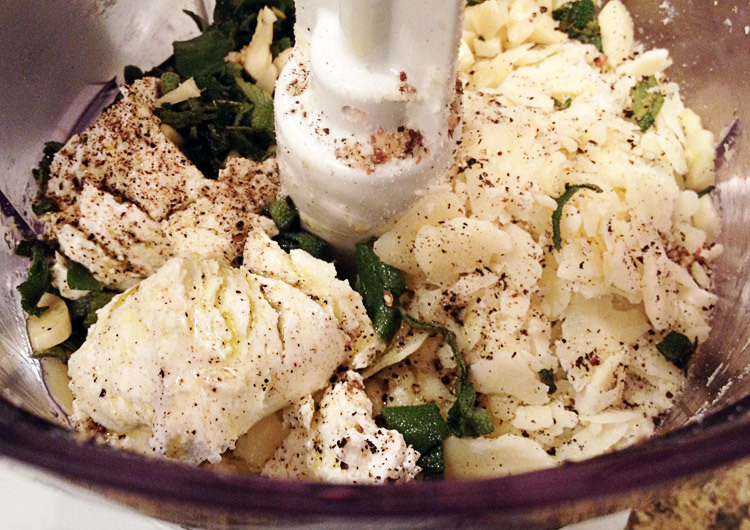 Add walnuts, parmesan, fresh chopped sage, olive oil and garlic to your food processor and pulse. Add salt and pepper to taste. If you use pre-chopped walnuts your filling will be a bit smoother – if you want more texture use whole walnuts and pulse only until crumbly. 1. Distribute the filling between your four pie shells and spread flat with a spoon or rubber spatula so you have a thin layer of pesto at the bottom of each pie shell. 2. Keep the filling about 1/2 to 1 inch from the edge of the shell. 3. 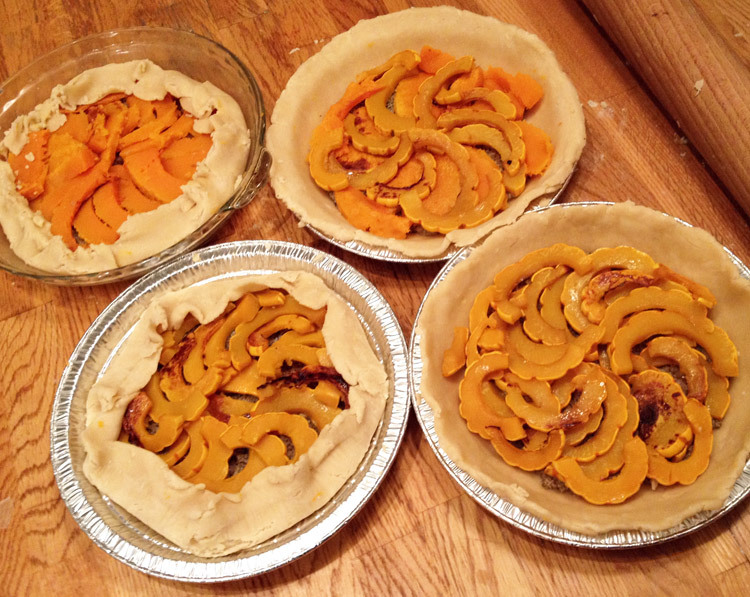 Layer the squash wedges around the top of the pie. You can start at one spot and slightly offset each wedge as you go. Or you can place at 12 o’clock, 3 o’clock, 6 o’clock, 9 o’clock, then repeat in the gaps until it is all filled. Or if you don’t care about how it looks layer them any which way to cover up the filling! 4. 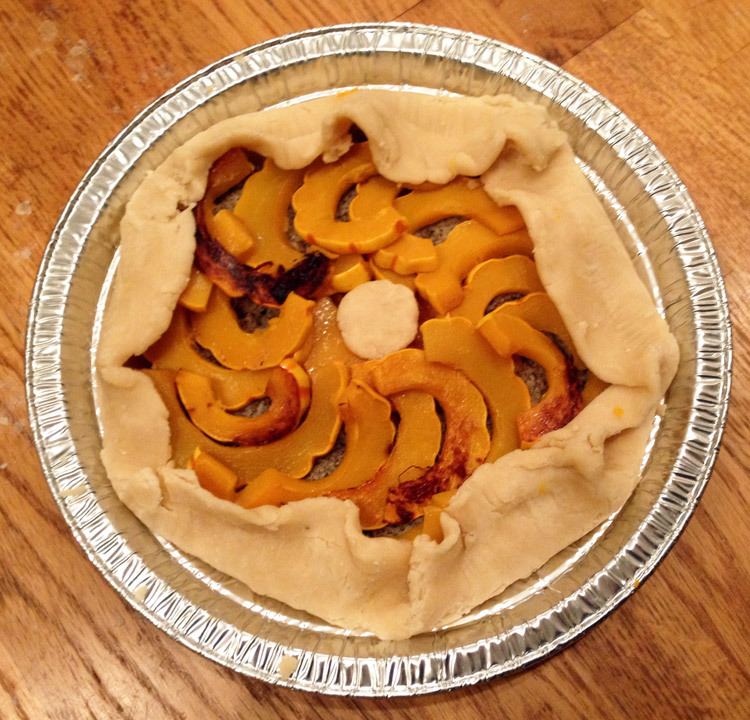 Fold the edge of the pie shell towards the inside of the pie, covering up the edges of the squash. At this point you can keep in your fridge for your party, bag and freeze for later, or bake in the oven according to your pie crust recipe / package instructions. Basically bake until the crust starts going golden brown. Is it worth it to make your own crust? 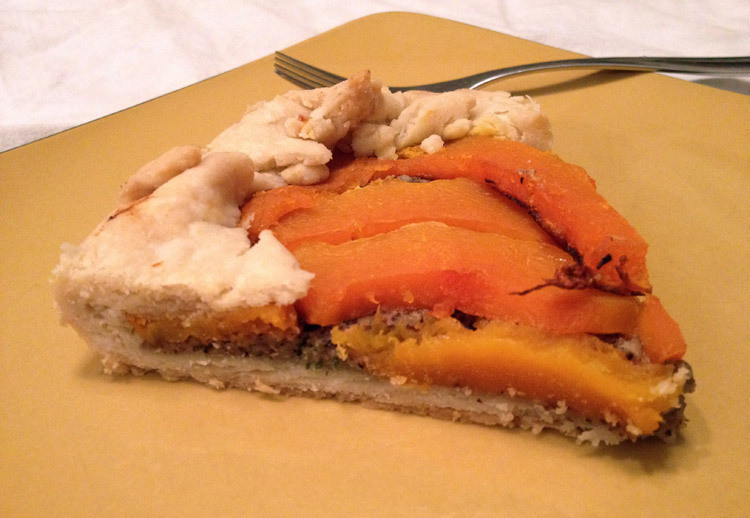 For the record, the first time I made this for Christmas I bought three pie crusts from my local baker. I think he charged me 2.50 or 3.o0 per pie shell and they were perfect and delicious. I am guessing they were a butter crust, as I made shortening pie crusts last night and could taste the difference. 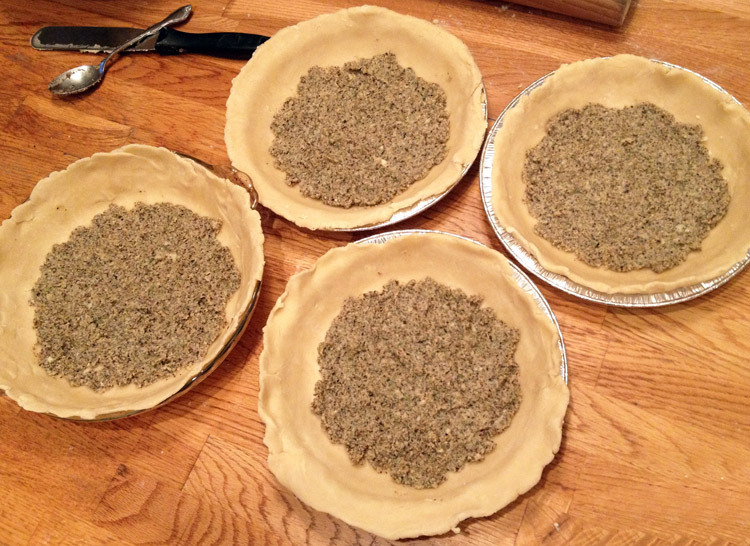 It has been a LONG time since I made pie crust from scratch. 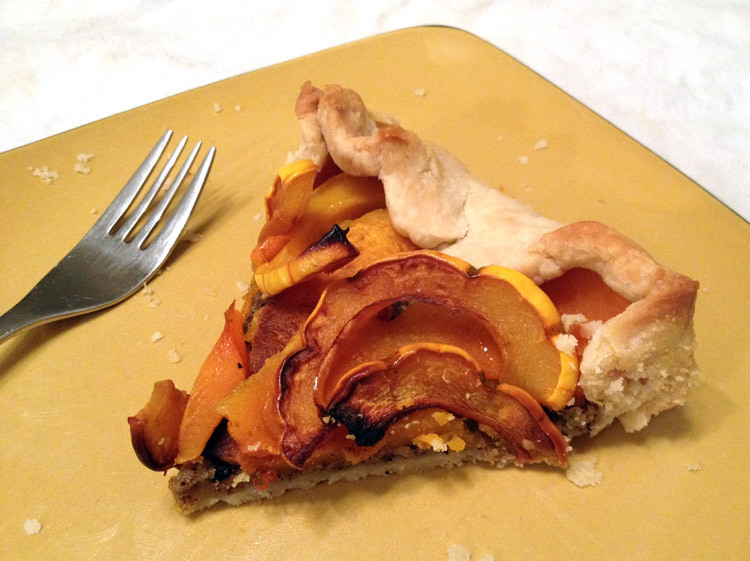 I now remember why people have pie crust recipes they swear by. I used this all shortening pie crust recipe from baking bites and I think it was a good recipe but I admit I did not follow everything exactly. I used the food processor which was an option, but I don’t think I would do that again. It was hard to tell if I’d added enough water but I didn’t want to add too much. Then I put the dough in the freezer to speed things up rather than the fridge. I think my dough was too cold when I started rolling as the first two shells were more finicky than the last two after the dough had warmed up a little. 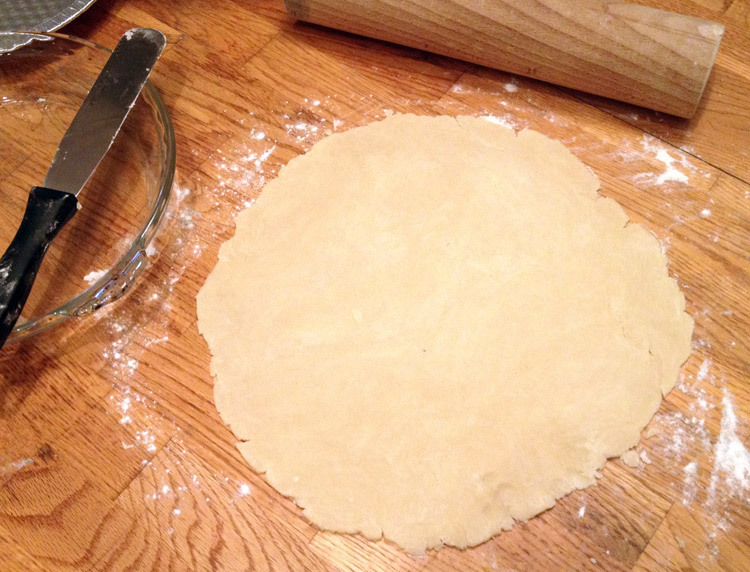 I did myself a favour and researched some pie crust rolling techniques and I believe this article on how to roll a perfect pie crust from finecooking.com probably saved these for me. Particularly the tip to rotate the shell, periodically slide a spatula / knife under the bottom, flip over, and roll in different directions around a clock. Anyways, next time I will either buy from my baker again or try a butter crust, hopefully from a recipe tested by someone I know and trust! Yay – I’m so glad you are sharing this recipe. As you said, we did it for Christmas and it was a big hit – esp with me as I ate a few extra pieces when no one was looking. This is one of my favourite vegetarian recipes – along with your roast tomato soup. PS I loved that you used favour instead of favor! I am so glad you shared it with me Kim! It is a very satisfying meal.